In just over 200 black and white archival photographs, Turner Publishing Company’s Historic Photos of Jacksonville depicts a vision of the Bold New City of the South that might surprise even native Jacksonvillians. The pictorial narrative begins around the same time as the advent of popular photography, before the Civil War (or, the War of Northern Aggression, as some old-school Jacksonvillian’s might say), and continues into the late 1960s. University of North Florida history professor Carolyn Williams’s captions provide insightful but never obtrusive explanations and commentary for the images, and her short essays before each section help to explicate the historical contexts of each of the particular periods of Jacksonville’s history into which the book. Particularly engaging are the smoke-hazed photos of the Great Fire of 1901, a devastating blaze that reduced much of the city to ashes. Also fascinating are the post-fire/pre-WWI images of Jacksonville. These detail an overlooked period when the city was a major tourist destination boasting a burgeoning film industry. Northern travelers would flock to luxury resorts like the St. James Hotel, where native Jacksonvillian James Weldon Johnson‘s father worked. When looking at photos of the crowded streets of downtown and the busy industry of the shipyards and train stations, it’s easy to feel a twinge of nostalgia for a time that passed before you ever lived, a time before the strip malls and suburban sprawl, a time before Jacksonville looked more-or-less like Every Other Place in America. 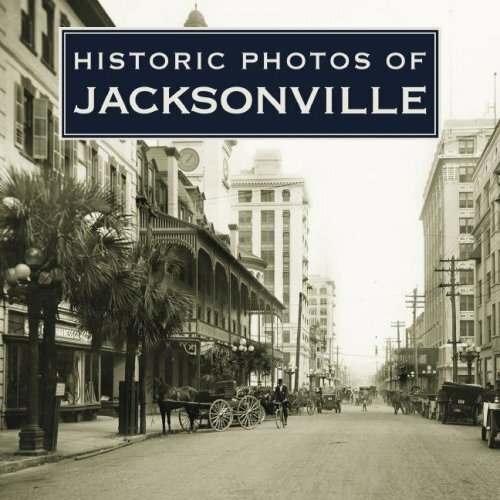 Historic Photos of Jacksonville will look great on your coffee table or on your shelf, preferably next to James Weldon Johnson‘s outstanding autobiography, Along This Way.